Please note ETA, travel agents phone and fax #'s. 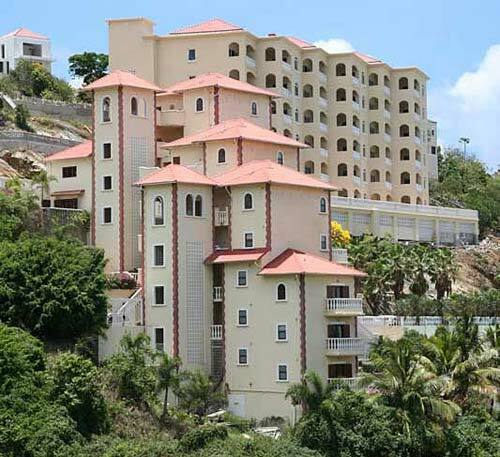 Nestled into the hillsides and just across the street from Dawn Beach, Princess Heights is ideal for those who prefer luxury, privilege, privacy, unspoiled landscapes in an elegant atmosphere. All suites have stuning oceanview and are exquisitely decorated. Each suite has marble floor in the interior, Italian clay-tiled terraces, living & dining area, fully equipped kitchen with granite-topped counters, lavish bathrooms with whirlpool bathtubs and all amenties to make you feel right at home. On site resort amenities are a freshwater pool, lush tropical foliage, daily maid service, concierge and free parking. Also available - limited room service, wine list, mini bar snack items, fitness room/gym, baby-sitting services, massage treatments, car rental arrangement and laundry/dry cleaning. Within a short stroll, enjoy Dawn beach, a choice of 3 restaurants and marina. Within a short drive, enjoy the island's many attraction, both French and Dutch, restaurants, duty-free shopping, dazzling nightlife, casinos and more. The following items are avaiable upon request: VCR, CD player, Sony Playstation. Revised cut-off dates apply for any new reservations as of today. Any additional reservations request over and above the aforementioned allotments will be accepted on a space available basis. Any telephone reservation must be followed by fax or written confirmation to reservation within two (2) weeks or reservations subject to cancellation.